Every Wednesday at St Francis Church we have a tots group & a craft group but on Wednesday 24th September we are joining together to support the World’s Biggest Coffee Morning, and invite you to join us. There will be cakes, prize every time tombola & lucky dip for the children. There will be handmade crafts & cards for sale. 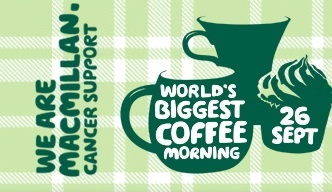 All proceeds will go to Macmillan Cancer Support.